Baseball’s winter meetings have become an annual rite of passage for the sport. In the first month or so after the World Series, the Hot Stove mostly burns on embers, but once the game’s movers and shakers convene for a week of wheeling and dealing, the calendar seems to instantly turn to the upcoming season. 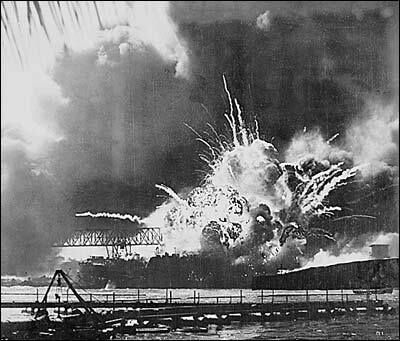 The attack on Pearl Harbor shocked the entire nation, including baseball executives who had gathered in Chicago for their annual winter meetings. This year, baseball’s small world has descended on Disney World, where more than a few free agents’ dreams will come true. Back in 1941, however, the baseball winter meetings were host to a nightmare. As the magnates of the game gathered in Chicago on the morning of December 7, the first news about the Japanese attack on Pearl Harbor started to filter through. Not long after, all ears were glued to radio bulletins and, instead of talking trade, the discussion centered on the impending war. According to newspaper accounts at the time, the White Sox and Tigers half-heartedly discussed a deal, while the rival Dodgers and Giants also touched base, but the shocking news of the day proved to be too much of a distraction. Over the next few days, the focus of the meetings had turned from glad handing to hand wringing about what role baseball would play in the war effort. 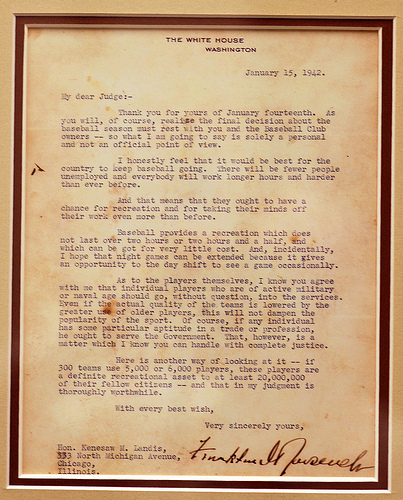 President Roosevelt’s “Green Light Letter” expressing his desire that the 1942 baseball season be played. Even though baseball would eventually get the blessing of both Congress and President Franklin D. Roosevelt to continue on with the 1942 season, it quickly became apparent that the landscape would be drastically altered. One day after the attack on Pearl Harbor, Bob Feller, who had already established himself as one of the game’s best pitchers, announced that he was enlisting in the Naval Reserve. Others, like Hank Greenberg, Cecil Travis, Buddy Lewis and Hugh Mulcahy, also quickly signed up for service. Eventually, over 500 major league players and 4,000 minor leaguers would serve the country in the armed forces, but despite being depleted, baseball would also soldier on. Amid the doom and gloom, some baseball business did get done in Chicago. On December 12, after the meetings had broken up, Branch Rickey used the occasion to make one of his few blunders, trading away future Hall of Famer Johnny Mize for catcher Ken O’Dea and pitcher Bill Lohrman (who would be sold back to the Giants in May) plus cash. Perhaps not surprisingly, even Rickey’s mistake turned to gold as the Cardinals went on to win the 1942 World Series over the Yankees, and Mize lost the 1943-1945 seasons to the military. The other significant news to come out of the Chicago meetings was the decision of both leagues to limit night games to seven per team instead of adopting a proposal to allow as many as 14. While voting on the measure, most baseball executives feared that if the season did proceed during the war, night games would be banned. Ironically, however, when President Roosevelt urged Commissioner Landis to proceed with the upcoming season, he recommended playing more night games so those working the day shift could still enjoy the national pastime. In response to the President’s request, Commissioner Landis reconvened the game’s owners and an expansion of night baseball was enacted. Aside from those teams without suitable lights (Yankees, Red Sox, Tigers, Cubs and Braves), every team would now play 14 games under the stars (the Senators were permitted to play 21 because of that’s city’s higher number of day workers). One casualty, however, was the scheduled installation of lights at Wrigley Field. Over 165 tons of steel and 35,000 feet of copper had already been procured for the project, but after Pearl Harbor, Cubs’ owner Phil Wrigley decided to halt the construction and donate all materials to the war effort. As a result, it would take almost 50 more years until the first night game was played at Wrigley Field. Baseball, like the rest of the country, would not only persevere through the war, but emerge even stronger. Shortly after the attack on Pearl Harbor, Connie Mack, the 79-year old owner/manager of the Philadelphia Athletics who was born during the Civil War and lived through the Spanish-American conflict and First Great War, said it best. “I have faith in my country and trust in our people and we’ll be all right again,” the Tall Tactician told reporters gathered for his birthday celebration, “With the nation facing turbulent days, sports, and baseball in particular, are going to help relieve the pressure.” Mack was right on both counts.